Were Hedge Funds Right About Starbucks Corporation (SBUX)? It seems that the masses and most of the financial media hate hedge funds and what they do, but why is this hatred of hedge funds so prominent? At the end of the day, these asset management firms do not gamble the hard-earned money of the people who are on the edge of poverty. Truth be told, most hedge fund managers and other smaller players within this industry are very smart and skilled investors. Of course, they may also make wrong bets in some instances, but no one knows what the future holds and how market participants will react to the bountiful news that floods in each day. The Standard and Poor’s 500 Index returned approximately 13.1% in the first 2.5 months of this year (including dividend payments). Conversely, hedge funds’ top 15 large-cap stock picks generated a return of 19.7% during the same 2.5-month period, with 93% of these stock picks outperforming the broader market benchmark. Coincidence? It might happen to be so, but it is unlikely. Our research covering the last 18 years indicates that hedge funds’ stock picks generate superior risk-adjusted returns. That’s why we believe it isn’t a waste of time to check out hedge fund sentiment before you invest in a stock like Starbucks Corporation (NASDAQ:SBUX). Starbucks Corporation (NASDAQ:SBUX) shareholders have witnessed an increase in hedge fund interest lately. SBUX was in 42 hedge funds’ portfolios at the end of the fourth quarter of 2018. There were 33 hedge funds in our database with SBUX holdings at the end of the previous quarter. Our calculations also showed that SBUX isn’t among the 30 most popular stocks among hedge funds. Let’s go over the latest hedge fund action regarding Starbucks Corporation (NASDAQ:SBUX). What have hedge funds been doing with Starbucks Corporation (NASDAQ:SBUX)? At the end of the fourth quarter, a total of 42 of the hedge funds tracked by Insider Monkey were long this stock, a change of 27% from one quarter earlier. 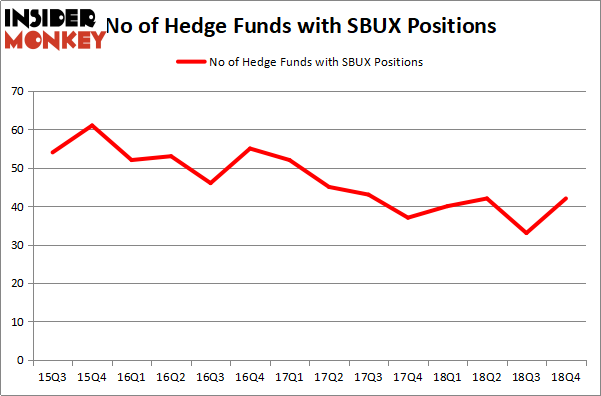 On the other hand, there were a total of 40 hedge funds with a bullish position in SBUX a year ago. With the smart money’s capital changing hands, there exists an “upper tier” of noteworthy hedge fund managers who were adding to their holdings meaningfully (or already accumulated large positions). Of the funds tracked by Insider Monkey, Bill Ackman’s Pershing Square has the biggest position in Starbucks Corporation (NASDAQ:SBUX), worth close to $757 million, comprising 12.7% of its total 13F portfolio. The second largest stake is held by Andy Brown of Cedar Rock Capital, with a $636.6 million position; 17% of its 13F portfolio is allocated to the company. Other professional money managers that are bullish comprise Israel Englander’s Millennium Management, John Overdeck and David Siegel’s Two Sigma Advisors and Peter Rathjens, Bruce Clarke and John Campbell’s Arrowstreet Capital. As industrywide interest jumped, specific money managers were breaking ground themselves. 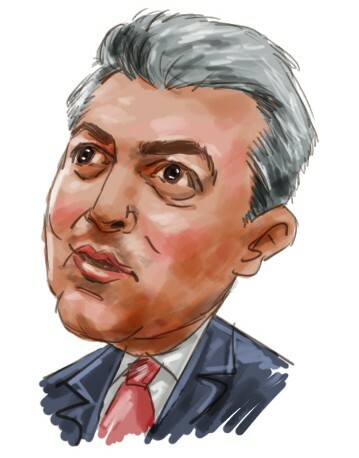 Pershing Square, managed by Bill Ackman, initiated the largest position in Starbucks Corporation (NASDAQ:SBUX). Pershing Square had $757 million invested in the company at the end of the quarter. John Overdeck and David Siegel’s Two Sigma Advisors also made a $352.8 million investment in the stock during the quarter. The following funds were also among the new SBUX investors: Peter Rathjens, Bruce Clarke and John Campbell’s Arrowstreet Capital, Jim Simons’s Renaissance Technologies, and D. E. Shaw’s D E Shaw. Let’s go over hedge fund activity in other stocks similar to Starbucks Corporation (NASDAQ:SBUX). These stocks are Booking Holdings Inc. (NASDAQ:BKNG), Caterpillar Inc. (NYSE:CAT), Lockheed Martin Corporation (NYSE:LMT), and Lowe’s Companies, Inc. (NYSE:LOW). This group of stocks’ market valuations are closest to SBUX’s market valuation. As you can see these stocks had an average of 59.75 hedge funds with bullish positions and the average amount invested in these stocks was $3752 million. That figure was $3367 million in SBUX’s case. Booking Holdings Inc. (NASDAQ:BKNG) is the most popular stock in this table. On the other hand Lockheed Martin Corporation (NYSE:LMT) is the least popular one with only 42 bullish hedge fund positions. Compared to these stocks Starbucks Corporation (NASDAQ:SBUX) is even less popular than LMT even though the hedge fund sentiment has started to improve at the end of last quarter. Our calculations showed that top 15 most popular stocks among hedge funds returned 19.7% through March 15th and outperformed the S&P 500 ETF (SPY) by 6.6 percentage points. Unfortunately SBUX wasn’t in this group. Hedge funds that bet on SBUX were disappointed as the stock returned 10.3% and underperformed the market. If you are interested in investing in large cap stocks, you should check out the top 15 hedge fund stocks as 13 of these outperformed the market.